I’m sure everyone on this blog enjoy stand up comedy evenings and shows. I’m also sure you care about some great causes and would be delighted if the two of the mentioned would merge into a perfect fundraising comedy event. Look no more, it’s here! 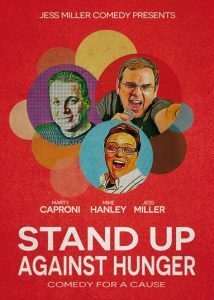 The popular Comedy Club is organizing (not for the first time) “Comedy for a cause” nights every month where popular comedians will perform donating all of the money from the sold tickets for a cause they care about. But, there’s a fun thing about donating! You get to pick the cause! Every month, the audience who comes to the performance get to choose between the 3 organizations. The one with the most votes gets the money and runs! We will present you some NGOs, health care organisations and many more. It’s up to you who gets the money to spend on noble things. Every visitor will have to pay the entrance fee of 5$ (and all of it goes to charity). Apart from that, you get a free entry drink for every purchased ticket and a night full of laughter. What else can you wish for? It’s Friday, the end of your working week and our lovely bar is waiting for you to change the face of your local community by choosing who will get the funny money. Ask your friends out, get a good laugh and make your night out worth every penny! It’s something new the bar is trying to start so make sure you be there to support that! We don’t have an exact monthly schedule, but we will let you know in advance when the next Comedy for a cause will take place! Expect some very popular faces and voices. Bring your wives, friends, mothers and kids. Ask your colleague out and help us in making our little town a better place. If you want to make a donation, you can contact us at the Bar during our working hours, which are (as always) 12PM- 3 AM. Our staff will give you all the information needed. Thank you in advance! This entry was posted in Comedy, Event on May 9, 2017 by Brayden Bell. 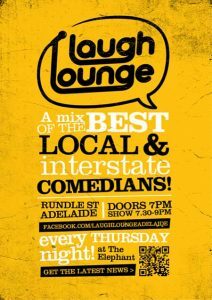 The Laugh Lounge was, as you probably already know, gone for three month since The Elephant bar was being freshly redecorated. Now it’s ready to welcome stand ups! It has been open for a couple of weeks now, but now everything’s ready for the Comedy to be back where it belong – the Lounge! It’s on every Thursday, starting with tomorrow! The comedians performing are being held top secret. We didn’t manage to find out who their guest for that big opening night are going to be – but no doubt it’s going to be just fantastic! And that’s not all. What is comedy without true rock n roll music? Welcome your favorite Tribute bands who will play for you ever Thursday. The best thing is – there’s no entrance fee and never will be! We believe laughs should be free for everybody. Not only have we redecorated the place, but we also expanded our menus and are sure everyone will find something for themselves. You can check the attached poster for details, and don’t be late! Comedy won’t be waiting! If you happen to be out of town on Thursday, pay us a visit this weekend. We’re having darts and pool nights with some free beer tasting and our well-known lovely hostesses. Also, join us for the game Sunday after lunch. We continue to support our local football teams by watching the game and cheering fro the bottom of out hearts. We don’t need to mention the round’s on us if they win. Cheers and see you Thursday! This entry was posted in Event, Stand up show on May 9, 2017 by Brayden Bell. We proudly announce the new Open Mic season in the city! When and where? You’re just about to find out everything. 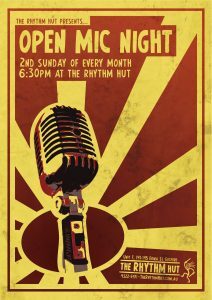 The iconic Rhythm Hut is back again with its most popular stand up event! The Open Mic nights are back and it’s the perfect opportunity for you to try out your comedy skills. The 2nd Sunday of this month is just a few days away! If you don’t feel prepared yet, stay calm. The Hut is going to have another one in a month. And then again in a month! It was more than 10 years ago when this extremely popular Pub has started with the Open Mic Nights. Those were very popular back then and now… everything’s back. The same old location, same old show – even the same old audience. The Pub is well know for its fabulous and friendly atmosphere, as well as tasty food & snacks. We don’t even need to mention a great choice of beer! I think you need no more reasons to join us on the next Open Mic night. If you’re not ready to perform, you can always come and just support the ones who are. The first one is gonna be huge! We heard it will be filmed and the performers will be able to take a copy of the tape with themselves. There’s also a surprise guest. We can’t tell you who that is, but we can tell He (oh, it’s a he!) performed here before and it was one of the best stand up night in our pub. If Open Mics are not your cup of tea, feel free to visit us any other day. Stand up is on every weekend (Friday, Saturday and Sunday), but we’re open every day of the week for you to enjoy our friendly atmosphere, amazing food and drinks. Don’t forget to live, love and laugh! And pay us a visit.